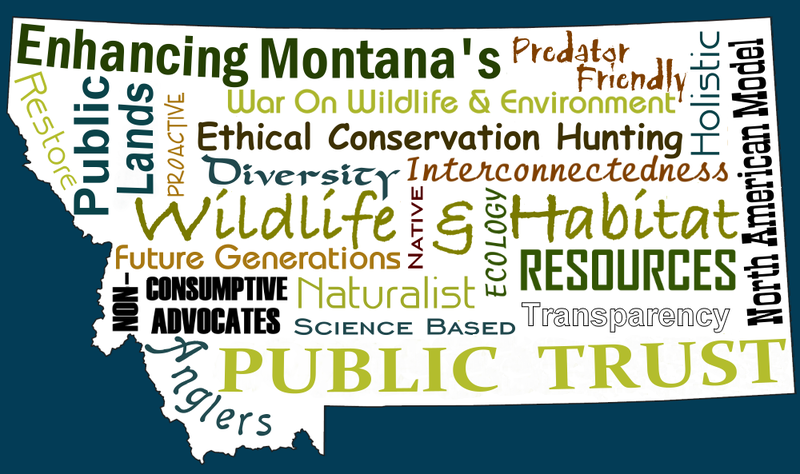 "Species in need of management"
The following are the Montana Code Annotated involving Bison in Montana. 87 is the subdivision for Fish, Wildlife & Parks and 81 is the Department of Livestock. (c) to set out specific duties for the department for management of the species. (c) shall cooperate with the department of livestock in managing publicly owned wild buffalo or bison that enter the state on public or private land from a herd that is infected with a dangerous disease, as provided in 81-2-120, under a plan approved by the governor. The department of livestock is authorized under the provisions of 81-2-120 to regulate publicly owned wild buffalo or bison in this state that pose a threat to persons or livestock in Montana through the transmission of contagious disease. The department may, after agreement and authorization by the department of livestock, authorize the public hunting of wild buffalo or bison that have been exposed to or infected with a contagious disease, pursuant to 87-2-730. The department may, following consultation with the department of livestock, adopt rules to authorize the taking of bison where and when necessary to prevent the transmission of a contagious disease. (3) The department may adopt rules with regard to wild buffalo or bison that have not been exposed to or infected with a contagious disease but are in need of management because of potential damage to persons or property. (4) The department may not release, transplant, or allow wild buffalo or bison on any private or public land in Montana that has not been authorized for that use by the private or public owner. (iv) contingency plans to eliminate or decrease the size of designated areas, including the expeditious relocation of wild buffalo or bison if the department is unable to effectively manage or contain the wild buffalo or bison. (f) identification of long-term, stable funding sources that would be dedicated to implementing the provisions of the management plan for each designated area. (6) When developing a management plan in accordance with subsection (5), the department shall provide the opportunity for public comment and hold a public hearing in the affected county or counties. Prior to making a decision to release or transplant wild buffalo or bison onto private or public land in Montana, the department shall respond to all public comment received and publish a full record of the proceedings at any public hearing. (7) The department is liable for all costs incurred, including costs arising from protecting public safety, and any damage to private property that occurs as a result of the department's failure to meet the requirements of subsection (5). (8) When adopting and implementing rules regarding the special wild buffalo or bison license issued pursuant to 87-2-730, the department shall consult and cooperate with the department of livestock regarding when and where public hunting may be allowed and the safe handling of wild buffalo or bison parts in order to minimize the potential for spreading any contagious disease to persons or to livestock. (a) The live wild buffalo or wild bison may be physically removed by the safest and most expeditious means from within the state boundaries, including but not limited to hazing and aversion tactics or capture, transportation, quarantine, or delivery to a department-approved slaughterhouse. (b) The live wild buffalo or wild bison may be destroyed by the use of firearms. If a firearm cannot be used for reasons of public safety or regard for public or private property, the animal may be relocated to a place that is free from public or private hazards and destroyed by firearms or by a humane means of euthanasia. (c) The live wild buffalo or wild bison may be taken through limited public hunts pursuant to 87-2-730 when authorized by the state veterinarian and the department. (ii) transferred to qualified tribal entities that participate in the disease control program provided for in this subsection (1)(d). Acquisition of wild buffalo or wild bison by a qualified tribal entity must be done in a manner that does not jeopardize compliance with a state-administered or federally administered livestock disease control program. The department may adopt rules consistent with this section governing tribal participation in the program or enter into cooperative agreements with tribal organizations for the purposes of carrying out the disease control program. (e) Proceeds from the sale of live, brucellosis-free, vaccinated wild buffalo or wild bison must be deposited in the state special revenue fund to the credit of the department. (f) Any revenue generated in excess of the costs referred to in subsection (1)(d)(i) must be deposited in the state special revenue fund provided for in 87-1-513(2). (2) Whenever the department is responsible for the death of a wild buffalo or wild bison, either purposefully or unintentionally, the carcass of the animal must be disposed of by the most economical means, including but not limited to burying, incineration, rendering, or field dressing for donation or delivery to a department-approved slaughterhouse or slaughter destination. (b) may sell a wild buffalo or wild bison carcass to help defray expenses of the department. If the carcass is sold in this manner, the department shall deposit any revenue derived from the sale of the wild buffalo or wild bison carcass to the state special revenue fund to the credit of the department. (4) The department may adopt rules with regard to management of publicly owned wild buffalo or wild bison that enter Montana on private or public land and that are from a herd that is infected with a contagious disease that may spread to persons or livestock and may jeopardize compliance with other state-administered or federally administered livestock disease control programs.